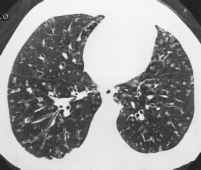 Figure 18 Tuberculosis. HRCT of a 19-year-old man from Bangladesh shows ''tree-in-bud'' pattern of bronchiolar disease in left upper lobe and both lower lobes. This pattern is consistent with active and contagious disease. 4-mm nodular and linear branching centrilobular opacities on HRCT. The ''tree-in-bud'' pattern has been coined to refer to these opacities (Fig. 18), and is analogous to the larger airway ''finger-in-glove'' appearance of bronchial impaction. 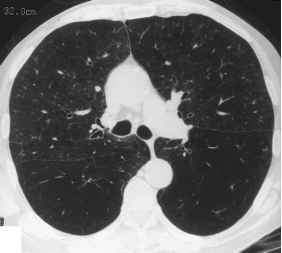 Indirect signs of bronchiolar disease on HRCT include subsegmen-tal atelectasis and air trapping. Figure 19 Cystic fibrosis. 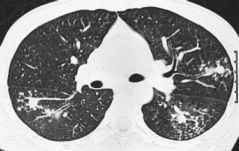 (A) HRCT of a 15-year-old girl shows dilatation and wall thickening of bronchi and bronchioles. There is destruction and collapse of the right upper lobe. (B) More inferior image of same patient in (A) shows ''tree-in-bud'' pattern of mucoid impaction in the right lower lobe (arrows). Figure 20 Diffuse panbronchiolitis. HRCT of a 70-year-old Asian male with progressive shortness of breath and chronic sinusitis shows diffuse dilatation and wall-thickening of bronchi and bronchioles and small peripheral nodules in a bronchiolar distribution. 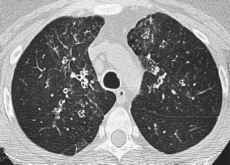 common etiologies include immunologic disorders (allergic bronchopulmonary aspergillosis), congenital disorders (cystic fibrosis; Fig. 19), neoplasms (such as laryngotracheobronchial papillomatosis), aspiration (of gastric contents and oral contrast material), and idiopathic causes (obliterative bronchiolitis, diffuse panbronchiolitis, Fig. 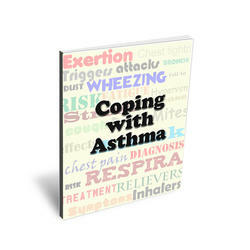 20; and asthma, Fig. 21). Figure 21 Chronic asthma. HRCT of a 33-year-old woman with chronic refractory asthma and decreasing respiratory function shows dilatation and wall thickening of bronchi and bronchioles. The patient underwent bilateral lung transplantation 6 months later.